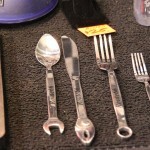 Filed Under Big Hoss, Chip Foose, Ford Fiesta, George Barris, Holley, House of Kolors, Ingersol-Rand, Ken Block, Las Vegas, Magnacharger, Metallica, Pawn Stars, Rich Christianson, Rutledge Wood, SEMA, SEMA 2010, Shelby, Tanner Foust, Top Gear, Valspar, Vaughn Gitten Jr.
Red Dirt Rodz. Yes, that is the real name for this paint color from House of Kolor. I got to name it. I just hope it makes it to the catalog. Ok, so I didn’t manage to get day 3 and 4 reviews up. If you have ever been to a show this size, with evening events and all that jazz in a city like Vegas (is there any other city quite like Vegas? ), then you might understand, things get crazy. I got home about 1:30 AM on Saturday, and I needed the entire day to veg out and recuperate. My brain hurt. My body was numb. I am starting to come out of the fog, but it has been a slow process. Visceral overload. Top Gear US premier- I got invited to check out the premier screening for Top Gear US. Being a HUGE Top Gear fan, I jumped at the chance. I had to make a hard choice between this and another high-profile event. I anguished for hours over it, but in the end, Top Gear got the nod, and I am glad I went. After the screening, I got to hang out and chat with the hosts and producers of the show for a bit. This show has so much potential, and I can tell you that these are the right guys for the job. One challenge that they showed us included hosts Tanner Foust and Rutledge Wood racing a Viper across a sleepy Georgia town. What were they competing against? A Cobra attack helicopter. It was pretty damn cool. 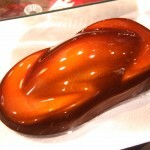 Cars- It goes without saying that you would be hard pressed to assemble a group of cars like the SEMA show. When you have 5,000 of the best built hot rods, customs, musclecars, and exotics from around the world in one place, going back to the reality of driving a stupid minivan is harsh. Looking at flawless car after flawless car you start to see things that you would never notice if a car was by itself. 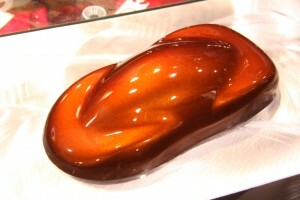 Paint chips, swirl marks, funky assembly flaws, it is easy to become a critic of cars that cost 100k to build. 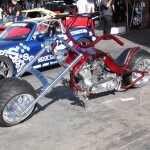 That said, I don’t spend much time looking at the cars at SEMA. Crazy? maybe, but its the truth. Girls, Girls, Girls- You know, there is a saying that every group of “hot” people has an ugly person in the mix to even things out. When in vegas, its hard to find the uglies. Seriously, even outside the show, everybody in Vegas is hot. If you can’t find the ugly people, then you might have to look in the mirror and that just makes me sad. Luckily for me, I’m a dude and I don’t really care what I look like, but the scenery is always excellent at the SEMA Show. SMOKE- Vaughn Gittin Jr. and Ken Block were outside in the parking lot serving up generous helpings of drift action. The Monster Energy Drink stage was the place to be in the evenings with some concert action and you could even manage to get into one of the drift cars and drive it yourself. How cool is that? Celebrities- If you follow me on Twitter ( @RedDirtRodz and @71BuickFreak), then you likely already saw my posts about my prediliction towards celebrities. I seem to be able to piss them off in ways that you wouldn’t expect. When the celebs are in “celeb mode” we get along well. That means when they are doing an appearance or otherwise working. But I have this habit of zeroing in on them when they aren’t ready to greet their adoring public, and blurting out their names like we go back 20 years. Don’t do that. They get irritiated. And FYI, Big Hoss from History’s PawnStars does not like having his picture taken while playing poker at a private table, who’d a thought……..
General Coolness–Chrome, speed and gears aside, the SEMA Show is full of cool. In recent years, the folks at Valspar, the makers of House of Kolors paint, have brought in some serious talent to display and demonstrate their abilities. 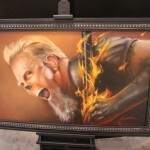 One of the coolest things I saw at the show has nothing to do with cars, but was on display at the House of Kolors booth–an airbrushed painting of James Hetfield, front man for Metallica (my favorite band ever), in this evil style. I love this painting. 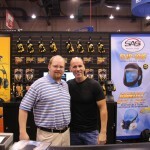 I have been to Vegas just about every year since 1999, sometimes twice a year, for SEMA and CES (Consumer Electronics Show), and while it is usually for business, it is a lot of fun too. If you ever have the opportunity, I highly suggest you take it, it is well worth the effort. These custom-built 4x4s are super funky. I like it, it kind of looks like a Murano, but only after it smoked up on Angel Dust. The real question is can you use them under the hood…. Well, here is one way to paint a Fiesta! 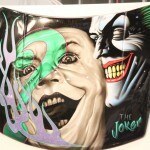 Another incredible builder, the infamous Chip Foose. It is getting hard to go to show where Chip is not involved on some level. 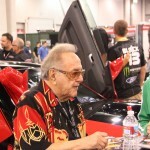 One of the master of customs, George Barris. My absolute favorite piece from the show. I don’t like modern Toyotas, but it is hard to beat a Hilux. This is ugly but sweet. 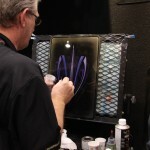 Another artist at the House of Kolors booth laying down some paint with an airbrush. 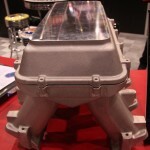 Holley does a lot for the LS engine, new for this year is the LS tunnel ram, shown here is one of three tops. This is the universal blank, that is pretty cool. 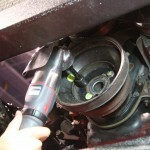 One of the coolest new tools I saw was this right-angle impact wrench from Ingersol Rand. It won’t break your wrist and its super fast. 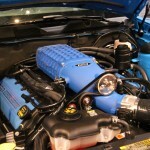 The latest offering from Magnuson is this blower for the new 5.0 Coyote in the Ford Mustang. that belt looks complicated. Rich is a big guy. Standing next to him, my head looks huge! Pinstripes are cool, this guy is flawless. When I first saw his work, I thought it was digital, the lines are so damn clean. 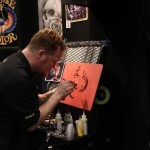 The artists in the SATA booth are beyond incredible. It looks like a photo. 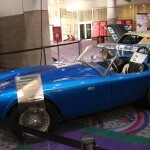 The very first Shelby Cobra. This is pretty cool. Top Gear taxi. How cool is that? 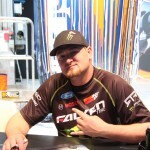 Vaughn Gittin Jr. was on hand signing autpgraphs for Ford.